My name is Catherine and I am the host editor of the International Poets page for the monthly Australian magazine, FreeXpresSion. This is a magazine which upholds family values and is widely read by all ages from young teenagers upwards. I introduce one overseas poet per month on my page, and having found your group online would like to invite any of your members who may be interested to send me a selection of poems for consideration. This entry was posted in Poetry, Writers and tagged Australian magazine, Catherine Lee on August 22, 2015 by shortlandpoetrycircle. If your thoughts are turning to Autumn and the call-to-the-classroom that September always sings, don’t forget that our new Masters in Writing Poetry is open for applications. The two year course starts at the end of September 2015, and you can study in one of two centres: the Poetry School’s Lambeth Walk classrooms in London, or at Newcastle University itself. Both groups of students will come together for an annual joint Summer School, alternating between London and Newcastle. In London, teaching takes place during the day on Tuesdays and will be tutored by Roddy Lumsden and Clare Pollard. You will also receive tuition from guest tutors from the Poetry School and Newcastle University teaching communities. Full details of the programme and the application process are available on the Newcastle University website. This entry was posted in Poetry, Writers and tagged Clare Pollard, Newcastle University, Roddy Lumsden, writing poetry on August 22, 2015 by shortlandpoetrycircle. Please take a note of all the events and dates coming up in our Autumn program. Sorry it’s a bit wonky but, hey, we are all poets, aren’t we! 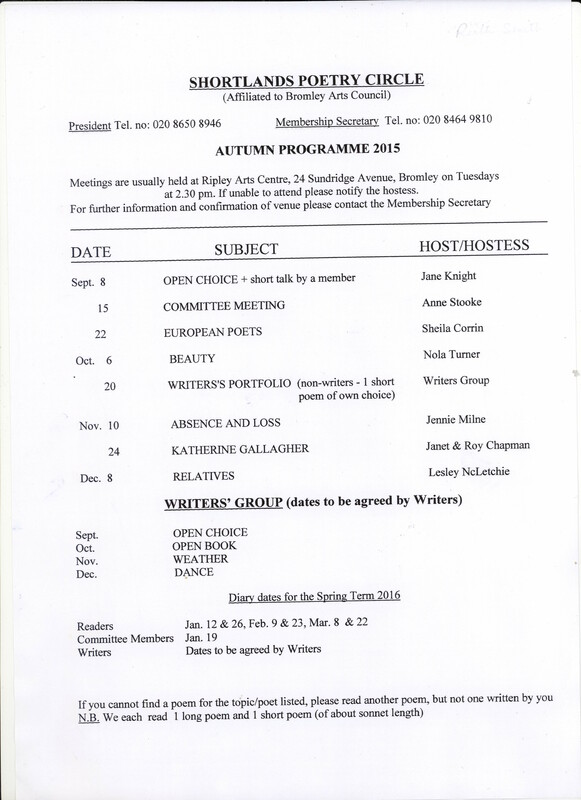 The Autumn program for Shortlands Poetry Society. This entry was posted in Poetry Events, Shortlands Poetry Circle and tagged about poetry, Shortlands Poetry Circle Autumn Program on August 22, 2015 by shortlandpoetrycircle.